I'm back with Halloween Tutorial Number two for 2012! This is another familiar look. 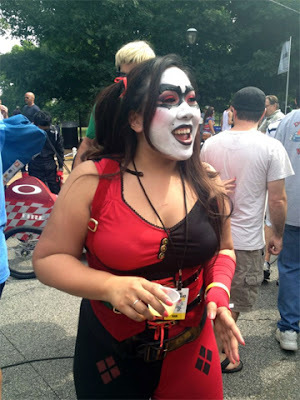 I wore it for the Batman Themed Red Bull Soap Box Race my friends and I participated in over the summer. 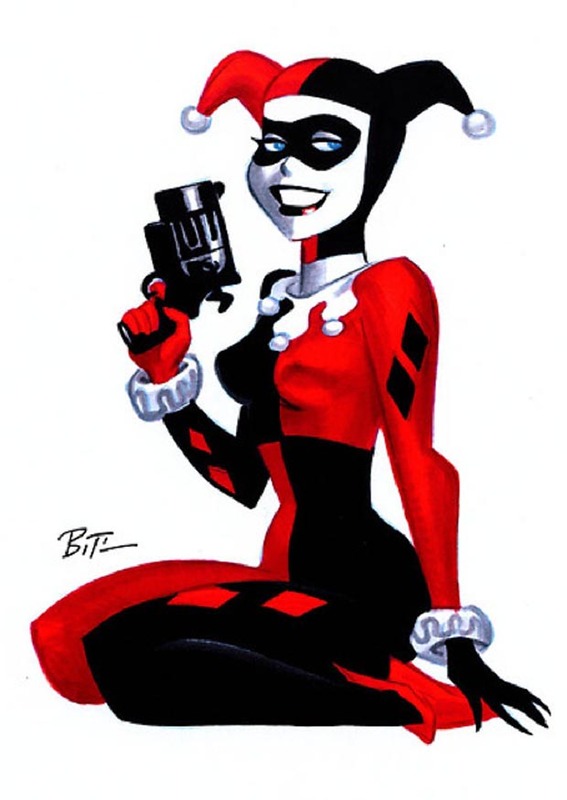 I played Harley Quinn, Joker's Girlfriend. 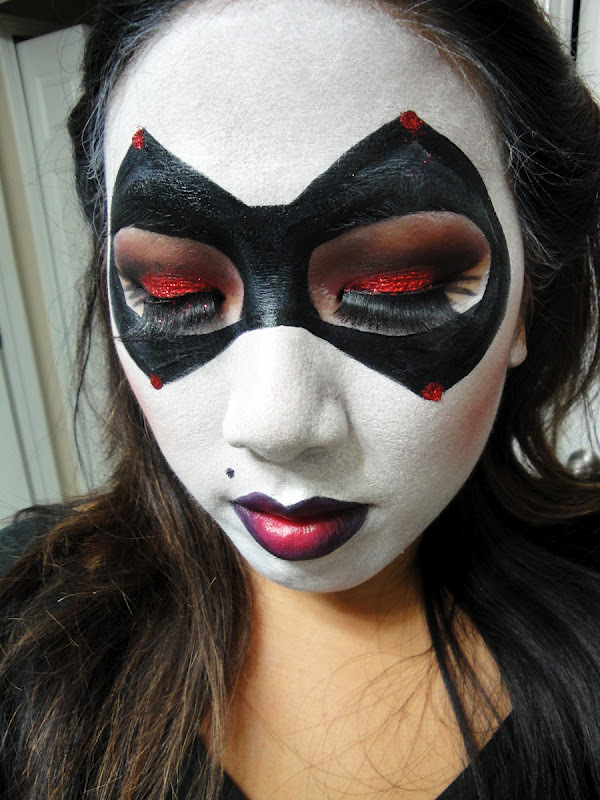 It's a fun look to do so I recreated a tutorial for it. Check it out! Here's a shot of the look I did over the summer. I do like how it came out better here...I spent a bit more time on the makeup since I was actually going out in public as opposed to doing it at home and wiping it off, lol. I changed the look a tiny bit. 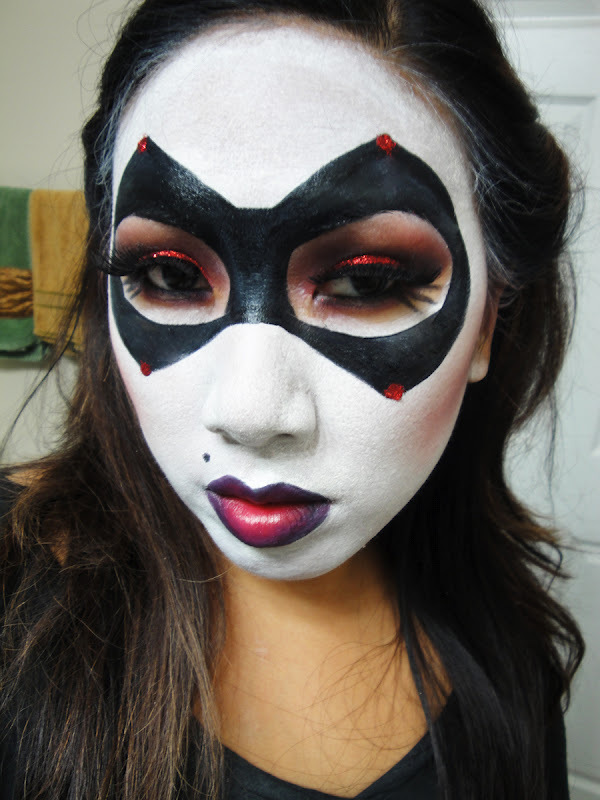 I didn't have black rhinestones to place around the mask, instead I used lash glue and red glitter to create the look of gems. 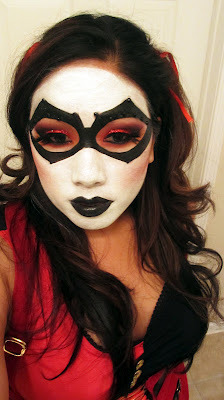 I did a red and black ombre lip instead of just black, and my mask shape is a little simpler. The hardest part about this look was getting the white makeup nice and opaque. 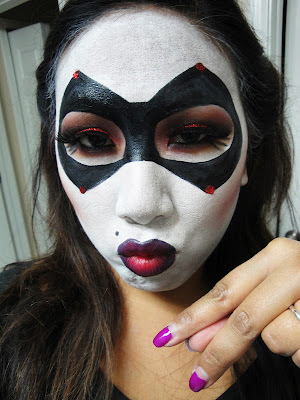 I recommend just getting a white cream makeup for this. I tried using a water-activated paint and it was a pain in the booty. I do like the ombre lip this time around - I decided to switch it up for this look because ombre is in! The list of products is actually really short. I reused a lot of the products - example, eyeshadow as blush and eyeliner as lipliner. Stay tuned for the next tutorial! Also, i'm still taking requests! FTC Disclosure: Products sponsored for tutorial. I am not affiliated with this company and not paid to make this video. These are my honest thoughts and opinions. TAG: 10 Makeup Products I would Repurchase!